Captain David Matschke is well aware of the dangers he faces on the job. A firefighter for 32 years, he is trained to race to the scene of house fires, car crashes and even industrial accidents, breaking through windows and doors to evacuate occupants and routinely putting himself in harm’s way. But beyond fire itself, a study published today in the journal Environmental Science & Technology sheds new light on another, more insidious threat that may be putting firefighters’ health at risk: toxic chemicals in smoke. 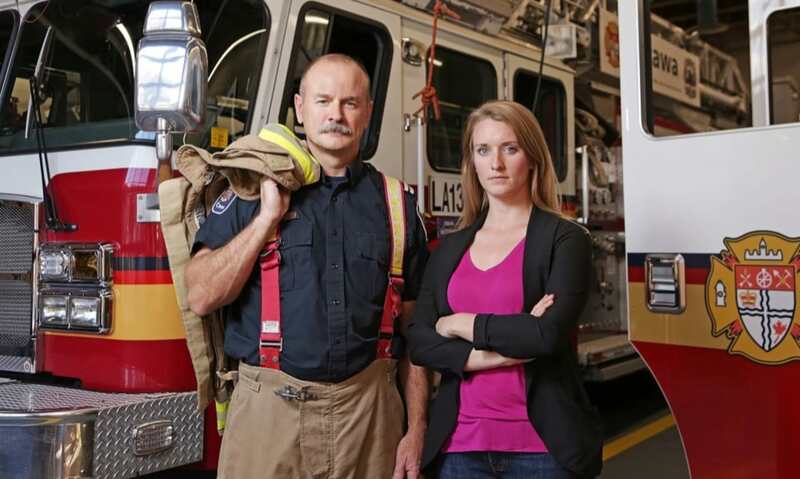 “Firefighters had from three to more than five times the amount of metabolites, or by-products of PAHs, in their urine after a fire compared to before the fire,” says Jennifer Keir, researcher at the University of Ottawa and senior author of the study. “Mutagenic potency of the urine, which reveals the potential for genetic mutations, also increased on average more than four times after a fire.” Since urine contains waste and toxins filtered by the kidneys from the bloodstream, its mutagenic potency is a good indicator of the presence of noxious components in firefighters’ blood. Previous studies have shown that firefighters have increased risk of cancers and other serious illnesses compared to the general population, due in part to their exposure to hazardous chemicals found in smoke. This is the first study to examine chemical exposure occurring during emergency, on-shift fire suppression. An unexpected finding relates to the route by which the monitored chemicals enter a firefighter’s body. The team found a significant link between PAH metabolites found in urine and levels of PAHs on skin, suggesting that firefighters are exposed to these harmful chemicals mainly through contact with their skin, rather than by inhalation. “Our study shows that the best way to reduce a firefighter’s exposure to harmful combustion products is to reduce chemical exposure to the skin,” says Jules Blais, professor of environmental toxicology at the University of Ottawa and research team leader. “Our research shows how firefighters are exposed to harmful chemicals, which helps us find ways to reduce those exposures - and hopefully reduce the onset of disease”.